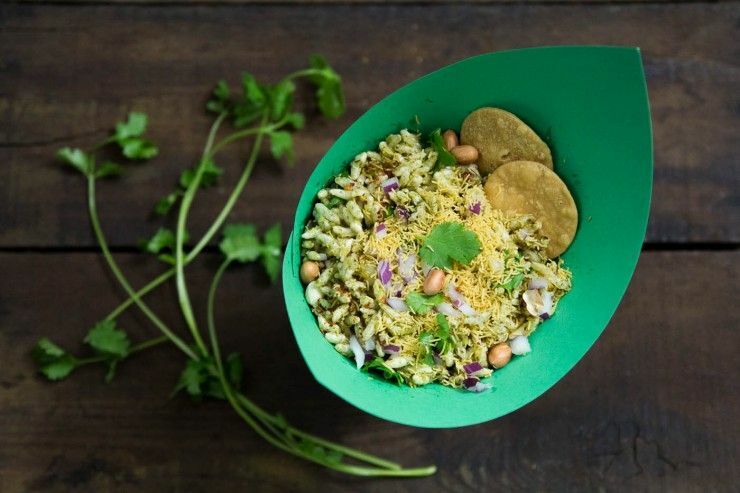 Bhel puri is another fun Indian snack food from Gujarat. It is a fun treat made from a balance of sweet, tart, salty and spicy, a common combination in Gujarati food. Gujaratis love to add sugar to savory foods. The other brilliant thing about bhel is the texture. It has just the right combination of softness with crunchiness, of dry with wet. I remember the first time I had bhel puri. Puja and I had just started dating. We went to a Navratri celebration in Fairfax, Virginia. It was the first time I had ever gone to an Indian event of any kind, and it was Puja’s first time bringing a date to one. She really wanted to go, because Navratri is where they dance Garba and Dandiya, and Puja loves Dandiya. But she was obviously feeling a little awkward about it, because she kept warning me that people would stare and they might make comments. India has such defined social norms and customs, this is just a part of the culture. I really had no idea what to expect. The event was being held in a gymnasium of a community college. There were so many people, many of them, like Puja, were dressed in Indian clothes. There were so many families: adults, children, teenagers. I was amazed at the willingness of children to socialize with their parents. We were completely new to the area, so we didn’t know anyone. We bought our dandiya (sticks) and Puja showed me the steps that I would spend the rest of the night trying to master. As a tall white guy, I stuck out like a sore thumb. I’m pretty sure I was the only non-indian at that one (I’m usually not), but everyone was really nice to us. At one point we went outside of the dance area to rest a little bit and talk. A man came up to us with a plate of bhel “for you,” he said, and introduced himself and we talked for a while. It was such a nice gesture. And I was laughing on the inside because Puja’s warnings turned out to be so unnecessary. I’ve been to a lot of garbas since then and we’ve always had a good time. The people are always so nice and friendly. Many people go out of their way to make me feel welcome. I’ve learned the dance very well after years of practice, so people are pleasantly surprised that the white guy knows the steps and compliment me on how well I’m doing. I always think of this when I eat bhel. Bhel is one of those foods that a lot of people get excited to have. I see this with many Indian street foods, like pani puri or pav bhaji. Perhaps because it reminds people of being in a big city in India like Mumbai or Delhi, of going out and having fun, the way it reminds me of my first garba. In Bombay, bhel is sold by street vendors in paper cones, much like we have created in our pictures. The ingredients of bhel are not particularly complicated. It uses two of the most common chutneys: tamarind chutney and green (cilantro mint) chutney. These are poured over puffed rice called mumra (or kurmura, in Hindi). Mumra is basically rice krispies, but bigger and puffier, and it doesn’t have those weird breakfast cereal flavors which I guess come from fortifying. When the chutneys hit the puffed rice, they soak into it and soften it up. To make it crunchy again, you add sev (little strings of fried garbanzo bean flour) and puris (a type of cracker). So delicious! Toast the mumra: preheat oven to 250 degrees. Spread mumra over a cookie sheet. Heat about 10 minutes, until the mumra is lightly toasted. 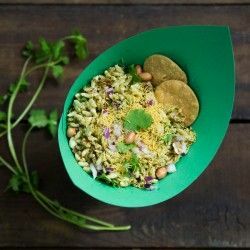 In a large bowl, combine all of the dry ingredients: mumra, baked potato, toasted peanuts, red onion, chaat masala, garlic chutney, chili powder, micro sev and crushed puri. Mix in the tamarind and green chutneys. Divide the bhel into two. Top each serving with some micro sev and the two whole puris. Serve. The crispy puri, chaat masala, and puffed rice are easily available at any Indian grocery store or online. 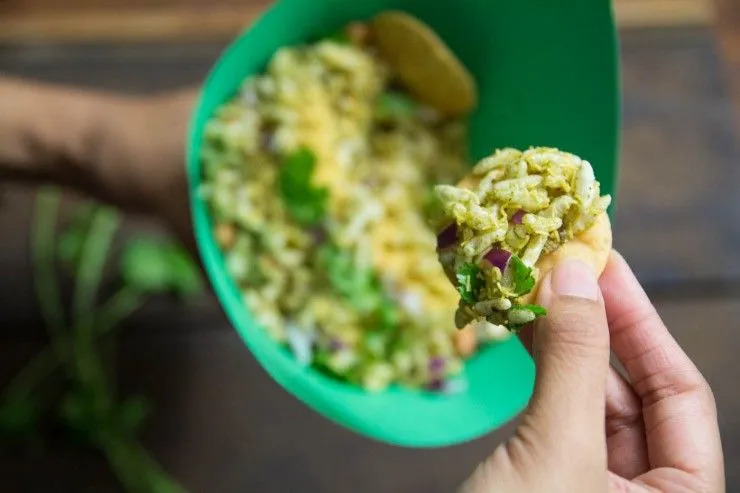 Comments on "Bhel Puri Recipe, A Menagerie of Flavor and Texture"
Sounds like a perfect little snack to me, Puja, with so many tastes involved. Very beautiful photographs, and I love the look of that little aqua-colred bowl :-).